Yes, everyone else has heard about the news – you and your partner have finally decided to tie the knot. And, because both of you love to travel and go around the world, you choose (surprise, surprise) Amsterdam as your wedding destination. Needless to say, it’s actually not that surprising, given the fact that Amsterdam is actually one of the most liberal places on earth, and nope, that’s not an exaggeration. Being liberal does not mean you have an excuse to be lazy about planning, though. Of course, you can’t expect everyone else to fix your dream wedding for you, especially since the destination is not as accessible as your town hall. Well, since this is your big idea for your big day, it’s best to make a list of all the non-negotiables you would like to have at the most special day of your life. With respect to Amsterdam, you don’t have to worry, because whether you want it inside or outside, Amsterdam has the perfect venue for your wedding. Here’s a list from which you and your partner can choose. Idea #1: Get married inside a church. If you want to get married in the midst of a peaceful and quiet ceremony full of symbols and rituals, then it’s probably a good idea to get married inside a church. Good thing there are several churches to choose from in Amsterdam. The Koepelkerk (Domed Church) is a beautiful 17th century church. It is located right at the heart of Amsterdam, a few steps away from the historical Jordaan. Recently, it was even voted as one of the best locations for getting married in the Netherlands. Fun fact: this beautiful church can be seen in a painting by artist Vincent Van Gogh. Built in 1872, this church looks like it came straight from a book full of fairy tales. 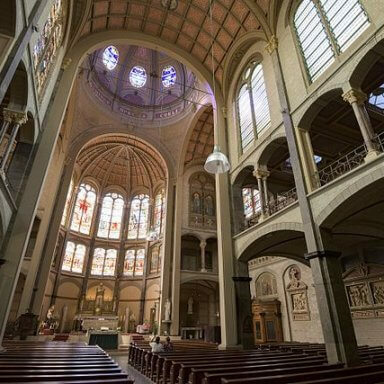 Located in beside Vondelpark, Vondelkerk is famous not just for its history, but also for its gothic architecture and its majestic ceiling to boot. It was designed by architect P.J.H Cuypers, the same architect who designed the Amsterdam Grand Central Station and the famous Rijskmuseum. Vondelkerk can accommodate up to 250 guests. Idea #2: Get married in a boat. Have you ever heard the Dutch saying, “step into the marriage boat”? Well, that saying didn’t become a saying for nothing. Getting married in a boat is a very real and exciting possibility in Amsterdam. If you choose this option, then you will not only have a most unique experience of tying the knot, but so will your guests. Idea #3: Get married out in the open. Another great idea would be to get married right out in the open fields of Amsterdam. If you like your declarations of love to be made in a proudly public way, then it would be best if you take this option. After all, love isn’t good for anything if it is kept hidden away from the eyes of others, right? Translated as The Emperor’s Realm, Het Rijk van de Kaizer is one of the best options for getting married in public in Amsterdam. You can choose to get married in the rustic guardhouse, or the wedding hall in the main building. Either way, it’s bound to be a wedding neither you nor your guests will ever forget. 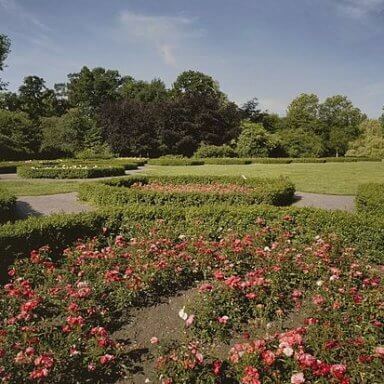 Because the Rosarium is essentially a vast open space of green, it can provide the excellent backdrop to your special day. You can have the ceremony by the rose garden, and then cap things off with drinks at the bar. Of course, the decision of where to hold your special day will lie ultimately in your hands. However, it sure doesn’t hurt to have a little help. 422 visitors rated Best Ideas for Getting Married in Amsterdam average 4.7 stars out of 5.